WOW!!! That is stunning! And I can’t believe that that’s all you really spent on it! Mega impressed with your sewing and shopping skills! Aww, thanks so much, Janey! You look very beautiful, again! It almost was like a big wedding! And thank you so much for your lovely comment. Wow! You do such amazing work, Anna, and I love how deeply you delve into the history of it all. Not to mention how impressive it is that you made this beautiful dress in a week! You look so pretty! Gorgeous! What a beautiful dress! I can’t believe you made it in a week– you’re crazy, in a good way! And thank you so much! It turns out it was a feat to sew that in a week, as I’m still recovering! Which ball? Where? How does one get on the guest list???? Thirnhill needs answers! 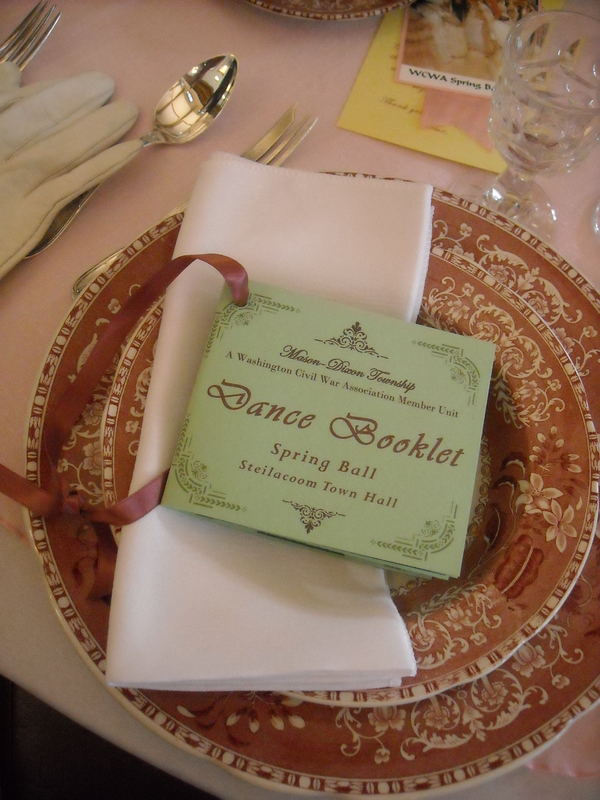 Well, the ball is put on by the Washington Civil War Association, although luckily you don’t need to be a member to attend. I believe it’s held every March, and tickets usually go on sale December/January. All you need to do is send in a check for $25 and your registration form (which basically is just your name, address, and what dish you plan on bringing to the potluck) and you’re on the guest list! Do they coach you through the dances? 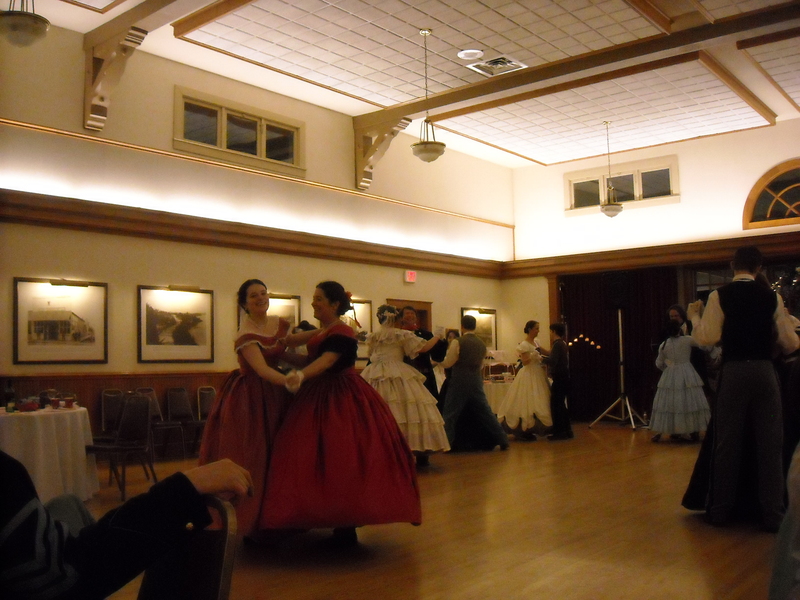 Thornhill is totally pants at remembering how to do those quadrilles and things! Sounds like great fun, especially the pot luck for period feasting. 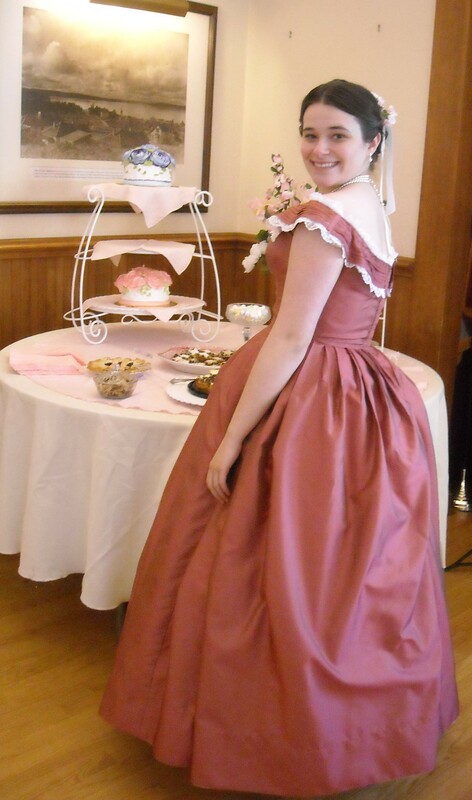 Your dress was a great color and the trim just makes the look. 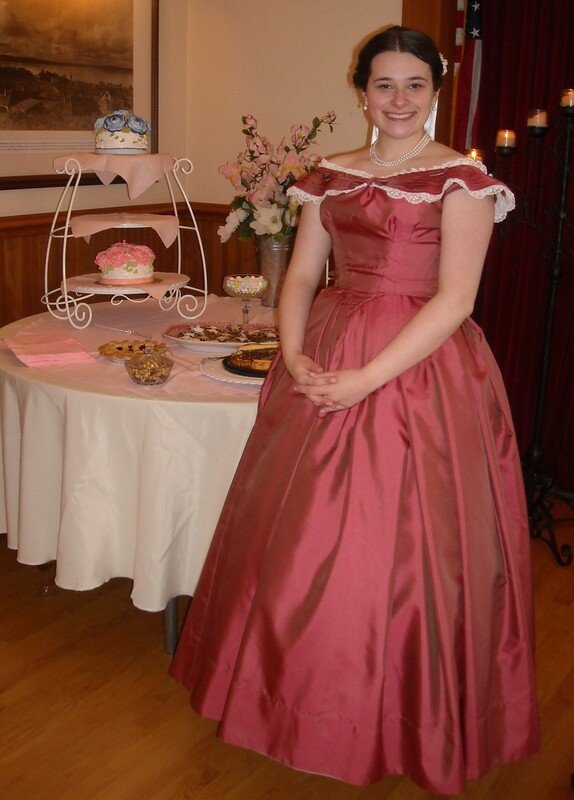 I followed your link to see Katherine’s yellow ball gown. It is all hand sewn! Yikes, I’m guessing that is due to the period of the gowns. 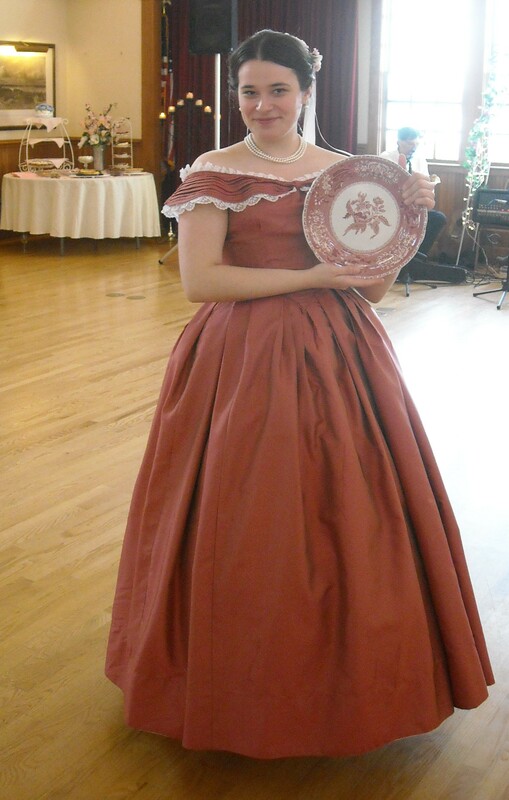 I’m really impressed at your ladies undertakings of not only the gown but all the accessories that go along with it. Sounds like you had a lot of fun! The dress is fantastic, the colour is so nice on you! Thank you! 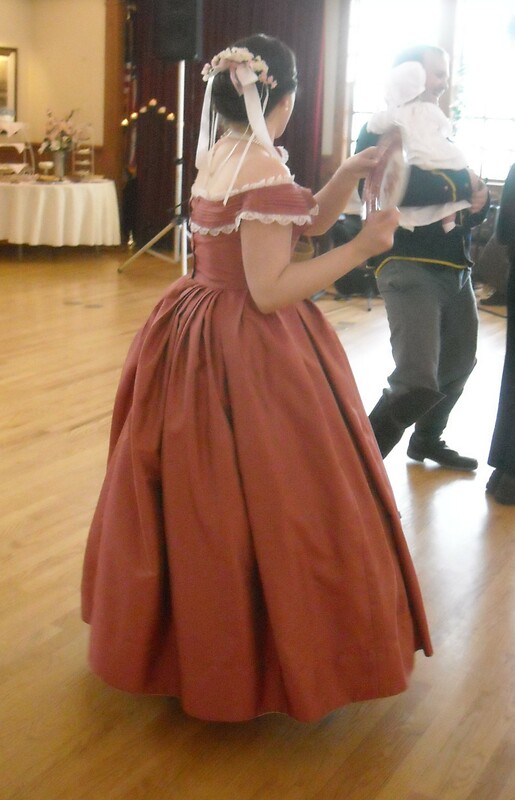 And yeah, the ball was a blast and I’m so glad that the thrifted fabric (including its color) ended up working so well. I did a dress in a week but I was at home the whole time after surgury! You are nuts to do it while working! But, yipes, that is a pretty dress! Nice job! 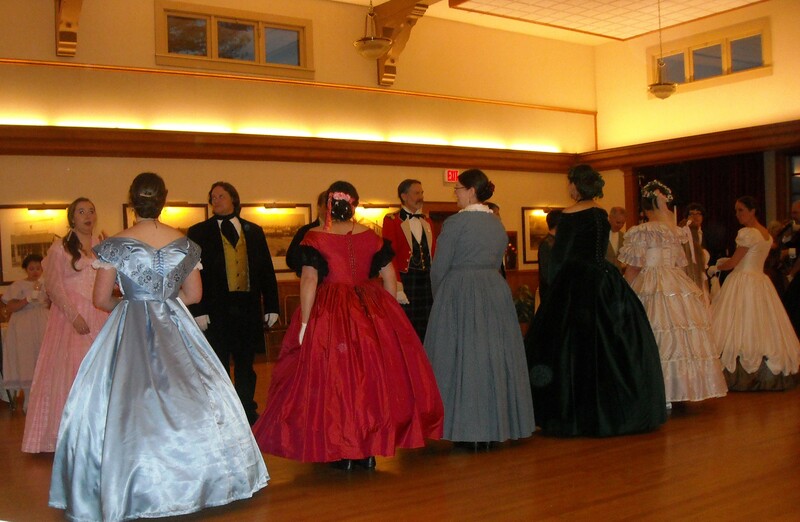 As to the sythetic fibers…I was in a bit of a debate with someone who made a comment on the internet that one will regret using synthetic fibers when recreating a Victorian or older dress. I think regret is too strong a word. If I’m on my death bed in 10 years, I will not be saying “I regret not spending $40 a yard on real silk for my dresses.” I CAN imagine regretting spending that money on a costume and not putting it towards my morgage so my husband doesn’t loose the house or putting it towards a legacy for my children or giving it to charity to make the world a better place. I can imagine spending it on silk and regretting wearing it and spilling juice on it or botching the whole sewing process and having piles of useless material. If it isn’t being entered in a contest and it isn’t being used as a museum piece then I can’t justify that kind of money either. And guess what? If you hadn’t said it was fake fibers, I doubt to many people would have known the difference! Again, you and your dress look GREAT! I agree WBV with your thinking. Anyone who remembers the first polyester fabrics can comisserate with me about being chafed under the arms because our moms made a swimsuit or sleeveless shift from a plastic-like fabric which was a quarter-inch thick and what flexible styrofoam would be like if there was such a thing! If I am hired to sew something in silk, that is a must do. However, the miracle of modern synthetic fabrics is certainly one way to cut the cost of an otherwise expensive hobby. Washable silk even is amazing. I believe there are some blessings, like indoor plumbing, that we are best off being thankful about it. Else, until necessity pushes us in that direction, experimenting with function and form is the real reason that most people create with fabric. Indeed, the dress is perfect as is. Lol I remember that flexible styrofoam. It didn’t breath and it didn’t soak up sweat. As a bathing suit you’d soon have your own internal swimming pool!